Hear me: I am not the craftiest mom. Yes, I encourage Xavier to paint or draw or color every day, but I'm not one to sit down and glue googly-eyes to pieces of construction paper I cut into shapes, or any of that. I've done exactly zero of those baby-handprint-in-plaster-of-paris things (is it even called "plaster of paris" anymore?!) I let Xavier go wild on exactly two Christmas ornaments last year and this year, and that's it. You get the picture. Freeform art = yes. Crafts = not so much. BUT! Every now and then I surprise myself. I was scrolling Instagram and saw a post about making stamped roses using a cut-up artichoke heart. I thought it was super cute, and made a mental note to buy an artichoke next time I was at the store. THEN later that week, I was cutting celery for snacks, and chopped the whole base off in one fell swoop. It rolled away and I realized it looked just like the artichoke heart that was in the rose stamping post! I decided to give it a try and see if I could do the same thing with celery instead of an artichoke. Spoiler alert: you totally can. 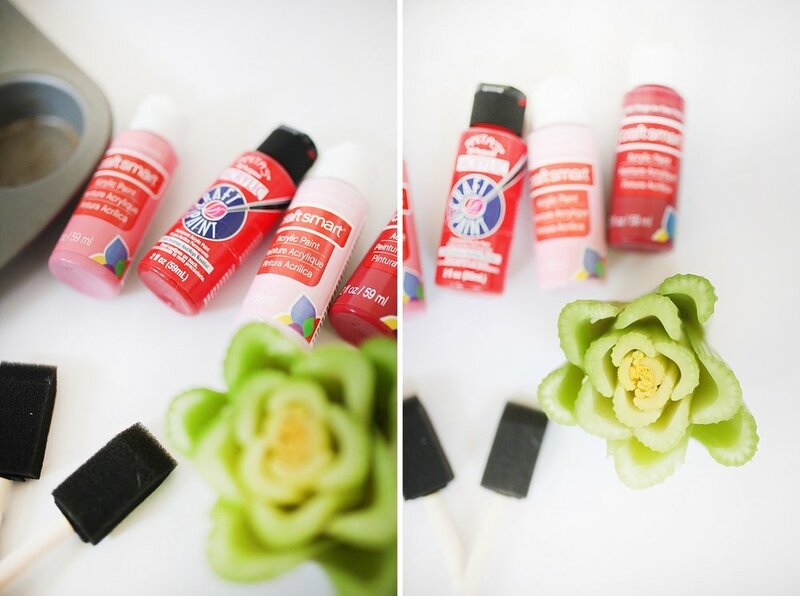 Brush your paint color of choice onto the celery heart with a paint brush. I found that a foam brush worked best for even coverage. I layered a fair amount of paint on for a really good stamp. Press the celery heart onto the paper and apply pressure evenly. Pull off the page and voila - a rose! When I wanted to switch colors, I just wiped the excess paint off the celery heart with a damp paper towel, then brushed on the next color I wanted to use. Stamp an abstract-ish pattern to turn into a card (see above) or frame it for some seasonal decor. 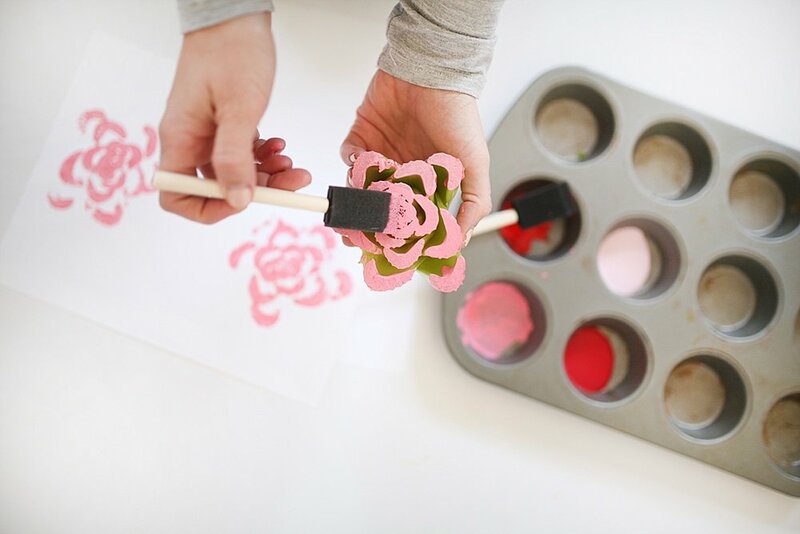 Stamp a few roses in a line, brush a few green stems + leaves and you've got a perfect print for grandma. I opted for this route for our valentines. Xavier drew on the stems and leaves with a little help from me, we penned a short + sweet poem and ta-da! A valentine that both grandmas loved. Roses are red / violets are blue / you are world's best (insert what you call grandma here) / and I love you! Growing up, we never had a "themed" Christmas tree. Each year, in the days following Thanksgiving, my dad and brothers would haul down the Christmas boxes and we would assemble and decorate the Christmas tree. Out came boxes and boxes of ornaments - some vintage, some new, most handmade by us kids over the years. I loved that so many ornaments had a story behind them, and that they meant something to our family. Matt and I have carried the same tradition into our little family as well. I like to call it a "story tree." As we decorate, we reminisce on the stories behind the ornaments and it's such a sweet time of recalling memories that are precious to us. As we've minimized, I realized we had a bunch of sentimental and keepsake items that didn't exactly make the cut for displaying in our home year-round, but it also seemed like a waste to have them sit in the attic, never to be touched or seen unless we moved or cleaned. So, I set about turning a bunch of this stuff into ornaments to add to our Christmas tree! I love that we'll pull these things out each and every year, and get to remember the joyful memories attached to them. That's what stuff is about after all, right? With a little bit of ribbon, twine and hot glue, you can easily turn any old thing into a beautiful ornament for your tree. These are perfect for even the least crafty of us - truly a ten-minute DIY! Tassles from high school and college. My husband and I each put our high school and college graduation tassels inside glass ornaments. I removed the year from the tassel and hot glued it to the outside of the ornament. Or, you could simply hang the tassle on the tree as-is! Souvenirs from trips. We love to collect little trinkets from our trips to turn into ornaments. It could be as simple as a magnet from the cheap souvenir shop, or something more meaningful, like a shell you found on the beach. Some of my favorites are the slingshot I bought in a market in Haiti, the pair of wooden castanets we found at a street fair on our honeymoon in Spain, and the perfect shell I found on the beach in Hawaii. Miscellaneous keepsake items. The coin my husband got when he graduated from paramedic class, our high school class rings and the chastity ring I wore, my "something blue" from our wedding with the sixpence I wore in my shoe, and the pennies I attached to my wedding bouquet (one for the years we were born, met, got engaged and got married.) Tokens from Matt's years in boy scouts. The first necklace he ever got me (the owl.) A silly ambulance I made for him in college. All kinds of random little things that have a story attached will now be hung our tree for us to reminisce about! Race medals. Matt and I have each run a handful of races, and I like keeping the medals as a token of that accomplishment. But, it doesn't fit my decor style to display them, so they were just sitting in our keepsakes box in the attic, until I had the idea to turn them into ornaments! Turns out John & Sherry at Young House Love had the same idea, so basically we're BFFs now because, same brain and all that. Items from loved ones who have passed away. When my Mimi passed away this summer, I went through her things to claim a few items to hold onto, to remind me of her. I was going through her jewelry box and found, randomly, a regular old plastic red and white bobber. My Mimi loved to fish, and fishing with her is one of my fondest memories. So I took the bobber, glued on some ribbon, and every year when I hang it on my tree, I'll be reminded of her and all the memories we have fishing together. And when my first dog passed away unexpectedly right before Christmas in 2012, I turned her tags into an ornament as well. Or there are the crocheted slippers my great-grandmother made. They've been sitting in my keepsakes box for years, but I was never going to wear them. So, I cut them up and made them into an ornament, that way they actually get remembered and used. There are any number of things that could be turned into an ornament in a similar way. Maybe you have a super ugly tchotchke from a grandparent that doesn't fit your decor, but you can't bear to get rid of. Make it into an ornament! It's possible to be minimal AND sentimental. Going minimal doesn't mean getting rid of everything that's meaningful to you! It might just mean thinking outside the box, and looking for ways to use those meaningful items in new or unconventional ways. Any other DIY ornament ideas? I'd love to hear! xo! Everyone has seen - or maybe even written - a "bucket list", right? Recently, when I was cleaning out my attic, I found several I'd written in elementary and middle school, titled "My Perfect Life" - haha! So funny, some of the things that were on there. I'm a big proponent of setting goals and being intentional about savoring life - just see my 101 in 1001 list or my 60 before 30 list. But I also think it's fun to take time to remember those awesome things you've already done in your life, and not be focusing so much on checking off the next cool thing. I just think about how cool it would be to have a written out list, in my great-grandmother's handwriting, of all the things she did in her life that she was proud of. From sewing an item of clothing to cooking an entire chicken, or whatever it might have been. I think about my kids and grandkids and maybe even great or great-great grandkids holding this little leather-bound book and get a little misty-eyed. Matt and I each have one (he started his on his 25th birthday, too!) and we keep them in our nightstand drawers. Any time I complete a goal, hit a milestone or have an experience that feels especially meaningful, I jot it down. I hope to hold onto this little thing all the days of my life and to have be a written record of the best and most beautiful moments and memories of my days here on earth! I used to be WAY into scrapbooking. Creative Memories paper cutters, spending hours pouring over the cardstock section at Michael's, cutting my photos into wild shapes and pasting them onto pages with a gluestick. Somewhere along the way, it ceased to be fun. I think it's when I really got into photography; suddenly I had 100 photos from an event and the whole process of printing photos and then wildly embellishing pages and journaling the entire event seemed like so. much. work. But! I am so passionate about printing our memories. I think it's incredible that I can access my Dropbox drive of photos from my computer, laptop, iPad or phone anywhere in the world, but nothing compares to sitting down and sifting through a box of snapshots, holding those tangible pieces of memory in your hands. I still haven't found a perfect system for printing and keeping our memories, but I've figured out bits and pieces and one thing that is really working well is Xavier's scrapbook. I ordered this baby book when I was still pregnant, and absolutely love it. But, I knew I'd take LOTS of photos of our sweet firstborn, especially in his first year, and wanted an easy way to catalog them outside of the space the baby book allows. I tried Project Life, but the album was way too big and it was too much for me. I didn't necessarily want all the insert cards and all the page options. I wanted simple, streamlined, easy. So here's what I came up with! It's basically a much more streamlined version of Project Life. I bought an 8x8 scrapbook at Hobby Lobby, the kind with binder rings. This was important, because it's super annoying to mess with the kind with screws. Plus, it's really easy to rearrange pages if I want. I chose insert pages that hold four 4x4 photos. I only ever shoot in square mode on my phone camera, because it just makes more sense to my brain, so 99% of the photos of Xavier are square format. But there are lots of different layout options, so you can choose a variety of layouts if that's your thing! Whenever Shutterfly offers their 101 free print deal (every couple months or so), I print 101 square photos for free, and only pay $8 shipping! I keep a folder on my desktop of the next 101 photos to print so they're ready to go when I get the email about the offer. I designed little 4x4 milestone cards and print them out on my home printer on plain white cardstock, and cut them with a paper cutter. I also designed a 4x4 journaling card with lines to write a bit if I wanted. I wanted to keep a very neutral, minimalistic vibe with the scrapbook, hence the black and white and bold pattern of the cards. I made the journaling card available as a download - just click here! I also made monthly dividers in the 8x8 size to slip into a page protector to separate each month. I'm a very chronological person, so I like that Xavier's scrapbook flows in order of his life. Although we're definitely going to need two volumes for his first year, because the first album is full after only six months! Shutter happy mama problems. And that's that! Every time the little orange envelope from Shutterfly shows up, I spend about 20 minutes slipping the photos into the pages, create the coordinating insert cards and call it done. It is SO easy and gets those photos off my device and into tangible form. And I love that I won't be scrambling to finish something up before his first birthday party, because it's getting done little by little as we go! I also like that the photos are just slipped into the insert pages, so I can easily get them out if I need them for something. No prying off decades of old glue! I'm also taking a black and white photo of him every week for his first year, and plan to order a photobook of them all from Artifact Uprising, my very favorite for photo books. Although this project felt daunting at first, I'm SO glad I've stuck to it. Babies change SO much, SO fast, and it's crazy to look back at that week one photo and how tiny he was. I know the book of all 52 weeks of his first year will be so, so precious. Do you scrapbook for your kids or family? What's your system? I'd love to hear! xoxo! I don't know about you, but I LOVE Christmas cards! Sure, now that we're in the age of Facebook and Instagram and blogging, it doesn't feel as necessary to send cards anymore, but it's still a tradition that I just love. There's something so special about receiving a piece of snail mail from loved ones near and far, even if I just "saw" them on Facebook yesterday. And even though I'm a big over sharer on social media, I've loved sending cards the past two years, too! I hate throwing away (or, if you're a good person who loves the environment, recycling) the Christmas cards but at the same time, why bother keeping a stack of cards laying around that you aren't doing anything with? Enter: my friend Casey's brilliant idea to turn the Christmas cards into a prayer book! I absolutely loved the idea. I listened to a simulcast with some of my very favorite ladies to soak up wisdom from right before Christmas and a few of them mentioned a similar family tradition: praying for people as you receive their Christmas cards. How many of us receive cards from people that we hardly think about on the day-to-day? What a cool and powerful way to keep those friends and family close to our hearts by praying for them. Our Christmas cards hung right by our front door, which I see every time I go to and from our bedroom, so as I passed them on the wall, I tried to remember to offer up a prayer or two. But I really wanted to share Casey's idea of turning them into a prayer book so you can continue praying for them throughout the year! I know this is a bit late, but if you still have that stack of cards sitting around, give this a go! Or bookmark for next year. It's super easy and a great use of those cards. All you need is your cards, a 3-hole punch, a paper cutter, a sharpie (or whatever you want to use to embellish the cover), card stock or cardboard for the covers, and two d-rings. Most of our cards were clipped with clothespins but for the ones that were hung with washi tape, I just folded the tape over the edge. I separated them by vertical and horizontal. I lined up all the vertical so they were all facing the same way and aligned their left edges. I did the same with the horizontal--only making sure that for the folded cards, the opening was to the right. Then, I hole punched them all! I have this nifty heavy duty 3-hole punch that worked great. I only punched two holes in my cards because they're typically 5x7 size or smaller, but this made it so that on all the cards, the holes were spaced exactly the same distance apart. One of those hole punches that goes in a 3-ring binder would work, too, but you might not be able to punch as many at once. I could do 3-4 at one time with this one. Then, I looped the cards onto the d-rings. I had put the cards in a specific order because I'm ridiculously type-a, so I started with the top of the pile and looped them so once I put them on the d-rings, they were front-side down. Once all the cards were on there, I cut two pieces of kraft card stock to 5x7" size, hole-punched them, and put them on the front and back as covers. I scribbled a little cover title and voila! It now sits on our kitchen table as a reminder to pray for our loved ones all throughout the year.